That’s why, today, speaking from the perspective of a father of two young children, Secretary Arne Duncan described a set of educational rights that should belong to every family in America in a speech at the National PTA Convention in Charlotte, North Carolina. This set of three foundational family rights can unite everyone who works to ensure that students are prepared to thrive in school and in life. 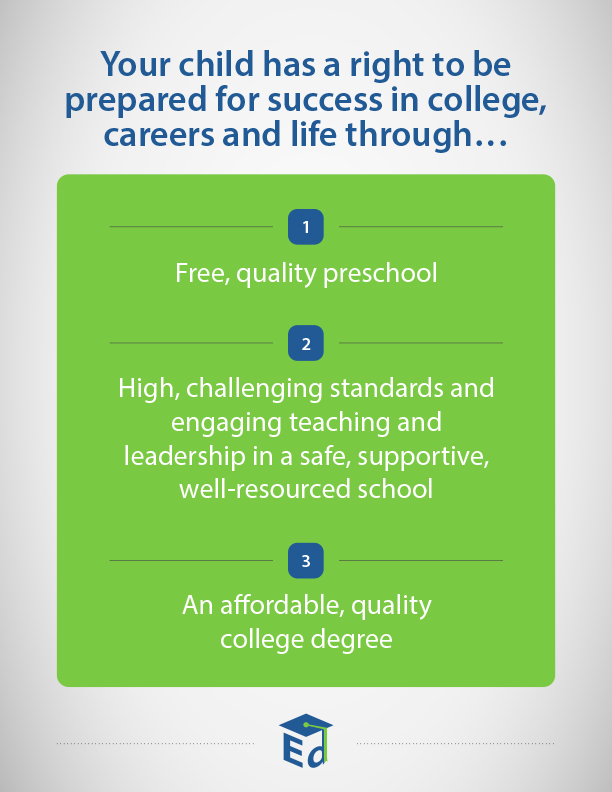 These rights follow the educational journey of a student—from access to quality preschool; to engagement in safe, well-resourced elementary and secondary schools that hold all students to high standards; to access to an affordable, quality college degree. Parents and families can use these basic—but necessary—elements of an excellent education to build deeper relationships with educators, administrators, and community leaders to support schools so that these rights become realities. At the Convention, Secretary Duncan also noted his hope that parents will hold elected officials and others accountable for accelerating progress in education and expanding opportunity to more children—particularly our nation’s most vulnerable. Secretary Duncan’s discussion of this set of rights complements work by the Education Department to reach out to parents—from the Dual Capacity-Building Framework for Family-School Partnerships released last year, to tools that can help families and students select the best colleges for their needs, to support of Parent Training and Information Centers and resource hubs. While in Charlotte, Secretary Duncan also participated in a “Future Ready Schools” panel to emphasize the importance of integrating technology into the classroom, especially as a tool for promoting equity for all students. To learn more about the rights that Secretary Duncan discussed today and to find other resources for parents and families, visit the Department’s Family and Community Engagement page. And, consider joining Secretary Duncan in a Twitter chat to continue the dialogue about parent involvement in education on July 1 at 1:30 p.m., ET, using #PTChat. I believe all the comments posted here have valid points. I STRONGLY believe we MUST pay teachers more money. Did you know that a prison guard makes more money than a teacher? That’s sad because if teachers made more money, wouldn’t more people want to become teachers? More teachers means a better chance of connecting with kids that need a role model. Making that connection with a kid will prevent them from ending up in jail. It’s simple math, oh wait that’s right there’s not a math teacher cause the pay isn’t enough to support their family ,so they work elsewhere now. IDK how to fix our educational system, but we need to. All children should have access to the education that will best prepare them for what they are capable of achieving as well as what their goals are. Parents, teachers, and counselors should help students set realistic goals for themselves. Not every student needs to go to college or wants to go to college. Many students I’ve worked with would be happy with a job that provides for themselves and, perhaps, a family without having to go through–what should be!–a high quality college education. Parents and teachers should first identify the needs of their children to start educating and teaching- an integrated approach where one should not continue without the support of the other one! When will teachers get a chance to give their points of views in what and how to teach? We are the ones WHO do the work so let us have our say and be acknowledged! Why do we just have to take all the changes in educations mostly from persons who were never in a classroom for one day? Just respect teachers in the U.S. like most of the other places in the world. I have taught in 5 countries -including the US. Teachers are not “respected” elsewhere either. For instance, did you know that France’s Education Nationale -the nation’s biggest employer – is the ONLY professional branch that does not provide occupational health assistance? How is that for an explicit lack of respect and implicit recognigion that teaching is hard [so much so that it would be too hard to tackle the issue]? Actually nothing is hard when you look/listen and look for the proper tools. The only places I have seen teachers actively (invited to) participate in policy setting was where Customer Care was central to the activity/locality. e.g. : In US Universities, In French vocational training schools, in UK training centers and even tiny schools -so geographically remote that officials trusted school heads to lead with enlightened collaboration. Do or die. Quality Management, which uses the exact same methodology as adaptive pedagogy, is a very efficient managerial toolbox that speaks to both heads and officials and brings everyone around the table. From the budget maker to the student. Policy writers have different interests than those they write policies for because the bang-for-buck equation gives them headaches. Carpet bombing is easier and satisfies the “universal” requirement of pulic service. Mmmmm… Could the future of education lie in policies so flexible they’d actually soothe rather than irritate? There is plenty that can be done in the mean time. Learning their language when they don’t speak yours is a great source of leverage power. The ability to conduct frontline evaluation -in their workplace- is also an incredibly powerful asset trachers can yield. How could that help you promote your independance in setting policies that cater for you and yours? Once again Duncan’s premise is completely flawed. The belief shared by policy makers currently in power, including Duncan himself, is that educators who work directly with students DON’T have high expectations. But they do. They just work in a broken system. Duncan’s approach to fixing the system is simplistic and wrongheaded. Duncan says “Parents can play a key role in DEMANDING the world-class education that their children deserve.” Anyone with an understanding of human learning and organizational change would never use “demanding” as their strategy for achieving excellence or quality. A beautiful, clear, thoughtul foundation from which to mobilize and build parental support for quality education. Would appreciate examples of how parents are organizing to assert these three principles. Thank you! Personally I think there should be more parents at the table making decisions when it comes to our children education. It should be an open door policy for the parents in our children education. There should be more roundtables set up for all stakeholders including parents when it comes to decision making in our children education. I agree with you. How can us parents help when we are not in the loop. We can provide many insight as to what and how “all” of us can help our children have a bright future. So True, Parents must engage in the setting of expectations both for their child and the schools. Parents need to participate daily in their child’s education, they are the rudder, they steer when the waters get turbulent. Advocate for your child, work collaboratively when possible with your school to make it better and expect and insist that your child is respectful and that their focus is on their personal best. Parents must also be able to rely on the Dept of Ed to uphold the right of an equal education for all, including in the “ALL” students with disabilities. Maybe one day Mr. Duncan will learn that a “quality” education involves more than just infusing the term into every statement. His efforts to improve education in this country may be better served by defining quality in absolute terms first. Of course we need “quality” pre-schools, affordable, “quality” college degrees, and of course “high”/”challenging” standards and engaging teaching. Try coming up with something novel for a change, not the same old meaningless speak that is included in every school’s, school district’s, or other public Education entitity’s mission and goal statements over the past 30 years. Still waiting for something truly novel to come out of the current administration’s Dept. of Ed. – sadly Duncan once again has failed to deliver. Secretary Arne Duncan described a set of educational rights. This is noting new! Every initiative enacted by the Department of Education system over the last 70+ years has promised but not delivered the goods. Money is not the problem/solution! Each year more $$$$ are being spent and the failure rate increases. Why has this been allowed to happen/continue? Could it be that over the last 6-7 decades the progressives agenda has slowly infiltrated/changed the education system from one of real teaching (reading, writing, arithmetic) to a system of indoctrination (social Justice and political correctness), to achieve their desired goals at the expense of our children! The U.S.Department of education is the seed bed from which this indoctrination grows. From the conception of the U.S.Department of Education the driving force has been money, power and control. Was this not the reason/wisdom our founding fathers did not give the education of the populous to the Federal government? The only way the educational system within this country will/can become successful in meeting the real needs of our children is to return to teaching traditional education rather than progressive indoctrinating! Traditional education put a man on the moon, why did we ruin/change a proven system. Also, if Arne Duncan really wanted/meant to have parent input why wasn’t there an outcry at the Fairfax, VA. school board and parent meeting/ fiasco. They say they want the parents involvement but when the parents wishes are contrary to there personal agenda they totally ignore the parents wishes. Duncan failed to deliver with common core and was rewarded with a promotion to his present position? I totally agree with your statements. I have taught for several years and have served as a Mentor to a lot of university students entering the teaching profession. The one item that always stood out was that new teachers were never told about the lack of funds in schools to provide the very basic of materials needed to teach. We can use all the fancy words when describing what we want education to be but until the very basics are provided to our teachers education will remain where it is. You can not raise a child without feeding them and clothing them, how can you teach a kindergartener to write without pencils and paper. How can a middle school teacher teach advanced reading skills if there are not enough books for students to be engaged with or third graders learn to write paragraphs properly if time in a school day does not allow for adequate time. I realize that teachers can provide the paper and pencils, books and skip a subject for more time on another but teachers are tired of spending their money and time on the basic essential’s that our districts should be providing. I taught in a district where the start time for teachers was 8:30 school started at 9:00 with breakfast in the classroom until 9:30 and school got out at 3:10, the end of day for the teacher based on contract was 3:30. How can a teacher prep and grade in so little of time. I was told to use my weekends to do what could not be done on contract time and in-service was done on weekends as well with no compensation except to keep your job. Our school system is so out of whack that until we get leaders who have taught in our schools and see what educators are up against in educating students who come to us from broken homes, wealthy, and do not speak English. Tell us Mr. Duncan what would you do to get a class of 31 third graders who 2/3 come from poverty, 7 that get no help at home on education, their hungry and bring nothing into the classroom except behavior that has them screaming, running and hitting others, 8 who do not speak well enough English to comprehend a 1st grade book and 6 who are above average meaning at or above grade level. What lesson plan would you use to get this class ready for the many tests they have to take and pass in order for you to keep your job. Please tell Secretary Duncan that holding elected officials and others accountable for providing our children with special needs a quality education is IMPOSSIBLE because USDE does not, itself, hold States accountable. USDE does not require sustained compliance with special education law. It only requires that violations of the law, once identified by the State, be corrected within one year. In this way the USDE regulatory compliance monitoring system anticipates and accommodates for ongoing violations of special education law. Under such a system SEAs and LEAs can, and do, constantly violate students’ special education rights. Until USDE gets serious about enforcing IDEA, we cannot hold our educational leaders accountable. The article entitled, “The Critical Voices of Parents in Education” was an insightful read and was grateful to have read it. It is viable lesson to encourage “parents” to dig deep and find the necessary framework, tools and centers to help the children. A great job; however, I’d suggest to include “guardian” as well. My parents were deceased, but my guardian was a fantastic person who made sure I had an awesome education. I would love to include guardian(s) like my very own. This is a very interesting article! As a father, I agree with Secretary Duncan main objectives! I am invilved ine ducation of my kids, I take them to different extracurriculum activities, they participate in sport and in VOLUNTARY activities. My 10. years of daughts has 5 years of experience in volunteering! I want for my children to ‘have equal opportunity to learn’. I totally agree that “Parents can play a key role in demanding the world-class education that their children deserve”. I have tried over the years to inforce the rights to my children education. However, I believe my children have lost out on a real education. Sadly to say, I have unsucessfully put more than 100% into my children’s education and not being able to help them. Now, my youngest just graduated high school. Everyone of my 5 children needed to take remedial classes when they started college. With the exspense of college and extra cost for remedial classes there is no other way to say it is UNFAIR! If I were able to do over, I would have home school my children. My husband and myself have always been accountable to our 5 children. My children have always been respectful and was never in any trouble all the teachers would praise them. My husband and myself have done our part, the United States Education system failed us. Please take my name off your list. Secretary Duncan speaks of what parents can do in “demanding” the educational rights of their children. What is missing here is what the taxpayers who suplly the monies to invest in a quality education should expect of the parents in supporting their children’s education at home such as insiting children do their homework; providing the encouragement and discipline for commitment to learning and demonstrating their support and commitment by being engaged in their child’s school with both parents (if possible) showing up at parents-teachers meetings and other school events. Expectations involved in a child’s education work both ways: from the parents and their children and from those who make the financial investment in their free education. Arne Duncan sounds so supportive and positive in this news release that I almost forget how much damage is being done to public schools, the students and their parents by demeaning teachers” efforts, by encouraging excessive testing in order to get adequate USDOE aid; and by encouraging more and more charter schools, taking resources and funds from public education. The only reason record numbers of graduates have increased is because the schools are able to put up smoke and mirrors and make it look like your child is doing better than they really are. And the one’s that this affects is the students that fall through the cracks that need help. Such as my son who just graduated from a decorated and well known school district and they have done nothing but lie and cover up the facts about the struggles my son has. They’ve denied his disability. I have black and white proof of it. I have audio tapes of the schools IEP notes being inaccurate. Proof of them not providing IEP minutes and those supports technically weren’t supplying him help for his LD. I’ve filed complaints with DOJ and OCR and as far as I can tell, the words on the page and the letter of the law are not followed. And my son graduated. Not because he did the work, but because the school made sure he got passed through. Let’s add a tally mark that graduation rates are up! !